of tall slender form, with small nozzle-shaped mouth, covered with cream white slip and a clear glaze all over, decorated with four panels framing large characters incised in outline on combed grounds filling the center of the sides between leafy peony sprays and clustered brush strokes freely painted in iron-brown on the rounded shoulders and above the tapered rimless foot, the edge of the foot unglazed showing the pale gray stoneware body. The four characters in the central panels may be read as “chun hua qiu dong” (春花秋冬), referring to the four seasons. A very similar Cizhou meiping of slightly smaller size in the collection of the Art Institute of Chicago is illustrated by Mino, Freedom of Clay and Brush through Seven Centuries in Northern China: Tz’u-chou Type Wares, 960-1600 A.D., Indianapolis, 1980, pp. 168-169, pl. 72 where the author refers to a “nearly identical piece” in the Philadelphia Museum of Art illustrated by Cox, The Book of Pottery and Porcelain, New York, 1944, p. 200, pl. 61 and illustrates two other closely related examples in private collections in Japan. The same two Cizhou meiping in Japanese collections are illustrated in Mayuyama, Seventy Years, Vol. 1, Tokyo, 1976, p. 182, nos. 538 and 539, where one of them is recorded as a Registered Important Art Object. 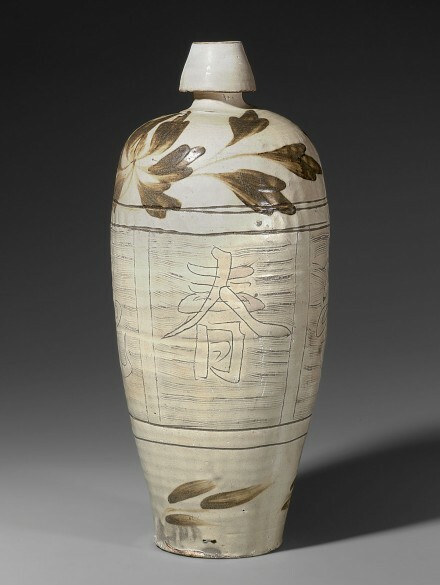 Another similar Cizhou meiping from the collection of Avery Brundage is illustrated by He, Chinese Ceramics: The New Standard Guide, London, 1996, p. 168, no. 320; and another similar example from the Ataka Collection, now in the Museum of Oriental Ceramics, Osaka, is illustrated in Yūkyū no kōsai: tōyō tōji no bi (The Eternal Beauty and Luster of Oriental Ceramics) Tokyo, 2012, p. 58, no. 33.